Many businesses are turning to apprenticeship programs to help them train qualified employees. In a tight labor market, where many employers are struggling to find employees who have the right skills, apprenticeship programs just make good business sense. That may be why the number of active apprentices has grown 42% since 2013. An apprenticeship program might be exactly what your business needs to fill the skills gap. To reap the full benefit of this training and workforce development opportunity, you’ll want to seek Department of Labor (DOL) approval for your apprenticeship program. While any business can start a training program and call it an apprenticeship, DOL approved programs must meet certain requirements. Once your apprenticeship program is approved, both your business and your apprentices will gain access to valuable benefits. The Department of Labor is responsible for recognizing and supporting apprenticeship programs across the United States. Standards for registration of apprenticeship programs are laid out in regulation 29 CFR, part 29. Under this regulation, the DOL has registered more than 22,000 apprenticeship programs across the nation. In 2017 alone, more than 2,300 new apprenticeship programs were established nationwide. There are 25 states in the United States that have their own, recognized apprenticeship agencies. 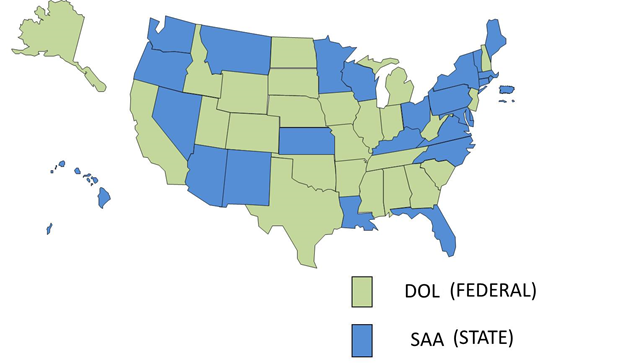 In those states, you can opt to seek state-level approval that will qualify you for DOL approval as well. Otherwise, no matter if your business operates in state with or without an apprenticeship agency, you can always go directly through the DOL who can help you register your program. By applying for and gaining DOL approval for your apprenticeship program, you validate that your program meets national standards. That means your apprentices will earn a nationally recognized credential. They also get other benefits including complementary federal resources and access to the ApprenticeshipUSA network. All of this means your apprenticeship program is more attractive to job seekers, making them more likely to apply with your business. Your business earns other, more direct benefits as well including the ability to apply for grants to help fund the training. Once approved, you’ll get support from the Office of Apprenticeship to protect the safety and welfare of your apprentices and develop new programs. Your apprenticeship program will be listed on the Apprenticeship Finder and you’ll also get access to the apprenticeship network, which provides customer service and support. Start by checking to make sure that the program you’re planning fits into an apprenticeable trade. The DOL recognizes more than 1,000 apprenticeable trades and your program needs to fit one of their recognized categories to be approved. Apprenticeable trades are ones with manual or technical skills that are universally recognized by the industry. Jobs in manufacturing, construction, power generation, healthcare, hospitality and even information technology are usually a good fit. Before you apply, make sure your program includes all five elements. The DOL has developed template documents that you can use to help document your program plan to show how you will move an apprentice from a low or no skill position to full proficiency. And fortunately, the DOL is ready and willing to assist employers through the registration process – including documenting the program plan. Getting all of the required components in place requires partnership with local agencies, business partners, and educational institutions. As the sponsoring business, you will provide the first two components: direct business involvement and on-the-job training. Your business will be directly involved as a sponsor and you’ll provide structured on-the-job training to apprentices. You’ll complement that training with related instruction. While you can organize this training yourself, most businesses partner with an educational institution to reduce costs and simplify programs. For example, Penn Foster delivers related instruction for more than 5,000 apprentices across the United States every year. Your training partner might also be able to assist you with pre-apprenticeship training to help employees build the basic skills necessary to enter your apprenticeship program. As a result of their learning, employees must earn increases in wages or other rewards for skills gained. Once their training is complete, they’ll earn a national occupational credential -- a guarantee that their training has prepared them for the job. A program missing even one of these elements does not meet the DOL definition of an apprenticeship program. Make sure you have all five in place before filing for DOL approval. Find the contact information for your state representative to the DOL. State representatives help ensure that you meet all state and federal requirements. Contact your state representative to review your program materials and help you file copies of the appropriate documentation with the Department of Labor. Use the template documents and Apprenticeship Standards Builder provided by the DOL to create all of the documentation you will need to apply. Penn Foster helps businesses develop essential related instruction and pre-apprenticeship instruction for DOL approved programs. We are one of the leading apprenticeship providers in the United States, with training for more than 100 occupation pathways, and have extensive experience working with companies of all sizes to develop registered apprenticeship programs. Our training consultants can walk you through the registration process and ensure that you have everything needed to successfully register your apprenticeship. Contact us today to get started, or download our eBook to learn more about how apprenticeship programs fit into the modern labor market.